The Earth has had five previous mass extinctions events, and we are now in number six. The current crisis is called the Anthropocene Extinction, meaning that it is caused by human activity. Much has been published recently about global climate change. But there is a much bigger picture to see if we just “connect the dots.” The planet is in a perfect storm of anthropocentric attacks on the biosphere that taken together will severely reduce the life carrying capacity of the planet. Forty-five percent of all mammal species are endangered or threatened. This includes everything from elephants to polar bears. Elephant populations are declining rapidly due to habitat destruction and poaching. 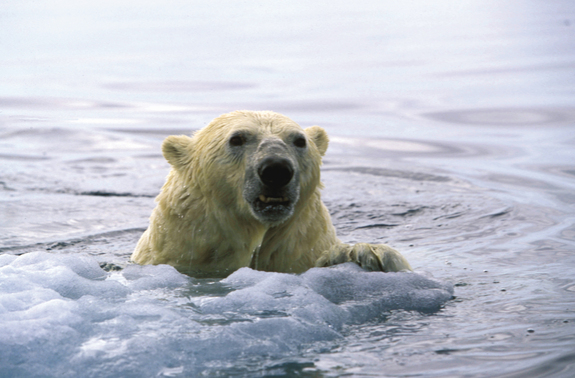 Polar bears are starving as the loss of the arctic ice sheet makes it harder for them to hunt for seals. Recently orcas have replaced polar bears as the apex arctic predators. The large dorsal fins on the orcas have mean that they would not swim or hunt in arctic waters. But now with the substantial loss of arctic ice the orcas have expanded into this new territory. Ice sheets are diminishing across the globe. The loss of the Greenland ice sheets will increase global sea levels by 30 feet. The loss of the Antarctic ice sheets would raise global sea levels by 300 feet. The Greenland ice sheets are showing increasing signs of collapse. There are lakes of snow melt atop of the glaciers. These lakes drain to the ground below. This lifts and lubricates the remaining ice and speeds its slide into the ocean. Global climate change is not a future concern; it is already upon us. Hurricane Patricia was the worst hurricane on record, greater even than Katrina or Sandy. California burns while South Carolina is underwater. The weather patterns have already spun out of control. There are droughts, fires, floods, and expanding deserts. Sea levels are already rising. In Alaska tribal villages are collapsing into the ocean. Island nations like Vanuatu are struggling to survive. In March of 2015 Vanuatu was hit by Cyclone (i.e. hurricane) Pam with wind gusts of 200 mph. It destroyed 90% of the capital city of Port Vila. Even with all the trappings of civilization, all life on Earth depends upon its biodiversity. Who decided that it was a good idea to grow food using poisons? Consider the case of the humble honey bee. This species is critical to agriculture. It pollinates a wide variety of crops. But bee populations have been devastated by pesticides. To replace the bees in an apple orchard it would take armies of farm laborers pollinating each blossom using ladders and paint brushes. The combination of global climate change, pollution, and over-harvesting will create a food crisis. We grow foods in arid climates unsuited for agriculture. Irrigation results in an increased salinity in the soils. Any use of irrigated land it a temporary solution to food production which causes a permanent impairment of the ecosystem. As we take ever more extreme measures to feed our growing population, every measure damages the biosphere and reduces our chances of long-term survival. We do slash-and-burn agriculture in the Amazon basin. But as this land is denuded of its foliage, the ground becomes rock hard within a few years, rendering it unusable. The only current option is to clear-cut new sections of jungle and to repeat the destructive cycle. Food production will continue to be a major challenge. Clearly we need to create a global economic system that can provide for the needs of all of Earth’s people, and do it is a manner that is sustainable. We also need to understand that we are not the only specie on this planet, and that our survival depends upon biodiversity. We need wilderness areas, pollution free wetlands, fecund oceans, rain forests, and coral reefs. We need bees and other helpful insects, and all manner of flora and fauna to survive. Famine may be our most urgent concern. Shifting weather patterns may cause our breadbasket regions to dry up. We have seen this before on the American plains in the 1930’s. The Sahara Desert is expanding southward into the savannah, causing civil strife and tribal, sectarian uprising as people struggle to survive. Beijing is endangered by the encroachment of the Gobi Desert. Much of the western United States are already in severe drought conditions. There is already tension between the farmers of the San Joaquin Valley and the population centers of the coast. The San Joaquin valley is the source of one-half of the nation’s fruits, vegetables, and nuts. The San Joaquin Valley is sinking by one foot per year due to the pumping of ground water. Southern California depends on the Sierra Nevada snow pack for its moisture. The 2014-2015 ski season was severely impacted by a lack of snow. Early indications are that the 2015-2016 season are projected to be seriously worse. Many civilizations have collapsed due to ecological disasters. Potable water will become as big of an issue as food. Clean, fresh water will become the new oil. One third of the Earth’s population depends on the snow pack of the Himalayas and the Tibetan Plateau for its water. This includes China, the Indian sub-continent, and Southeast Asia. But even the Himalayan glaciers are shrinking. In the beginning humans had little power to transform and destroy nature. Our ever increasing technology has given us greater and greater mastery over the Earth and its resources, and with that power we have the power to render the planet uninhabitable. Early farmers using sticks for plows, or early hunters catching whales from canoes did not have the power to undermine the ecosystem. It is a lot easier to clear a rain forest with a bulldozer than it is to clear it with a machete. It is hard to be optimistic about the Earth’s future. While we cannot destroy the Earth we can make it uninhabitable. It is likely that the Earth is near its peak in human population. Later in this century we will see a decline in population from droughts and famines caused by shifting weather patterns. We will continue to see a host of species going extinct. The decline is already happening. The best we can hope for is to reduce the future effects. Floods, droughts, fires, reduced availability of drinking water.